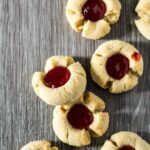 Peanut Butter & Jam Thumbprint Cookies – Deliciously soft and crispy thumbprint cookies loaded with peanut butter and filled with raspberry jam. The perfect cookies for PB&J lovers! 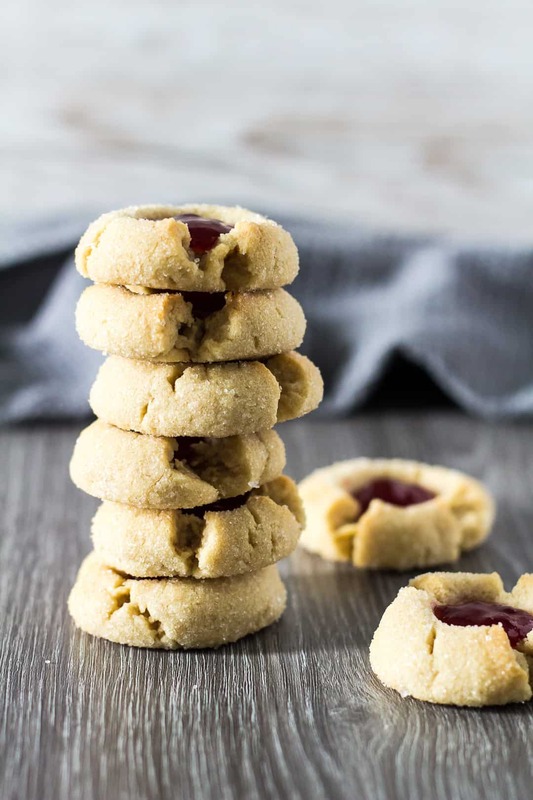 These cookies are thick and soft with crispy edges, they’re loaded with peanut butter flavour, and their indents are filled with sweet raspberry jam. Seedless raspberry jam: You can use a different flavour if you’d prefer. 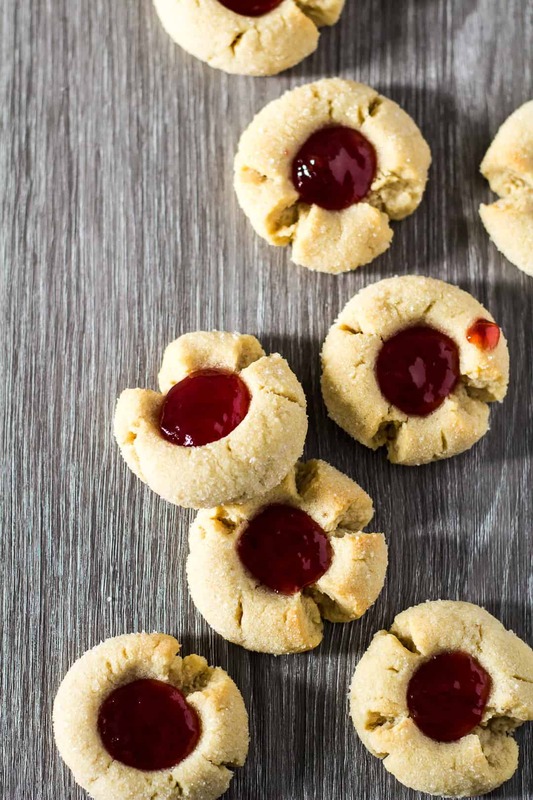 To make these thumbprint cookies, simply beat together the butter, peanut butter, and sugars. Add the egg yolk and vanilla, and beat until combined. Add the flour and salt, and mix to form a soft, smooth dough. Roll the dough into 0.7oz balls. Roll each ball in granulated sugar, and place on a baking tray lined with parchment paper or a silicone mat. Use your thumb, or the back of a measuring spoon (I used a 1/2 teaspoon measuring spoon), to make an indent in the middle of each ball. Bake for 10 – 12 minutes until firm, and lightly golden brown around the edges. The indents may have risen, so gently press them back down with the measuring spoon. Allow to cool for 5 minutes before transferring them to a wire rack to cool completely. Microwave the jam until runny. 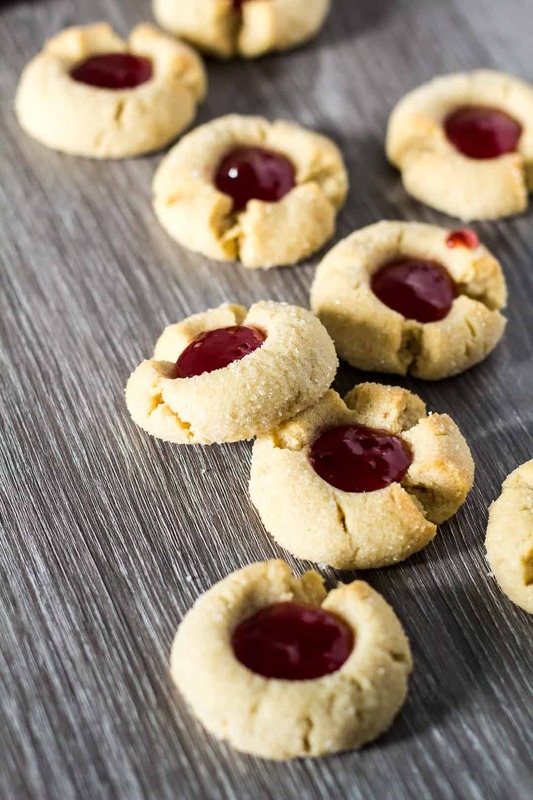 Spoon into each cookie indentation, and allow the jam to cool and set before serving. These cookies can easily be made ahead of time, too! How long will these thumbprint cookies last? These cookies can be stored in an airtight container at room temperature or in the fridge for up to a week. They also freeze well for up to 3 months. If you prefer freshly baked cookies (erm, yes! ), cookie dough balls, shaped, can be frozen for up to 3 months before baked. Check out my other thumbprint cookies! Want more PB&J recipes? Check out my Peanut Butter and Jam Bundt Cake! 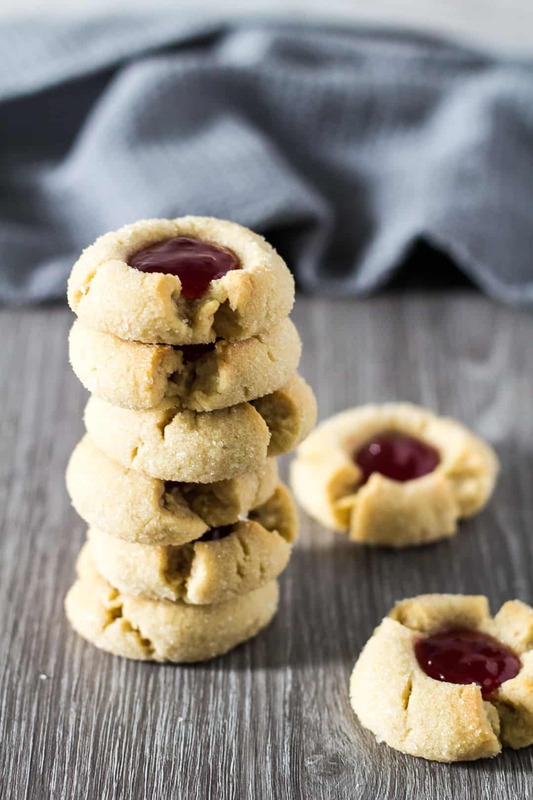 Deliciously soft and crispy thumbprint cookies loaded with peanut butter and filled with raspberry jam. The perfect cookies for PB&J lovers! Using a handheld or stand mixer fitted with the paddle attachment, beat the butter, peanut butter, and sugars until light and fluffy. Add the egg yolk, and vanilla, and mix until combined. Add the flour, and salt, and mix to form a smooth, soft dough. Roll the dough into 0.7oz balls. Roll each one in granulated sugar, and place on the prepared baking tray. Use your thumb, or the back of a measuring spoon (I used a 1/2 teaspoon measuring spoon), to make an indent in the middle of each ball. Bake for 10 - 12 minutes until firm, and lightly golden brown around the edges. If the indents have risen, gently press them back down with the measuring spoon. Allow to cool for 5 minutes before transferring them to a wire rack to cool completely. Add the jam to a microwave-safe bowl, and heat until runny. 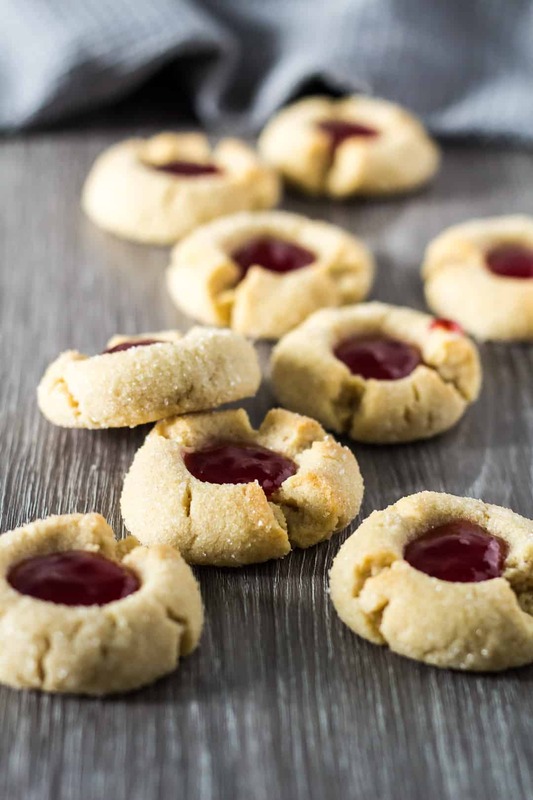 Spoon the jam into each cookie indentation. Allow the jam to cool/set before serving. Cookies stay fresh in an airtight container at room temperature or in the fridge for up to 1 week. They also freeze well for up to 3 months. Thaw overnight in the fridge before serving. Cookie dough balls, shaped, can be frozen for up to 3 months before baked. Loving these soft jam-filled treats like woah! Great recipe! There’s nothing like freshly baked cookies! 🙂 These look so good, and I’m seriously loving all that yummy jam in the center!